“I’m going to The Wizarding World of Harry Potter with my cousin this month!” I spent most of January telling anyone who would listen. “Oh, that’s so nice of you,” a lot of them replied. This response baffled me at first, until I realized that they thought that my cousin was a small child whom I had volunteered to chaperone around Universal Studios. 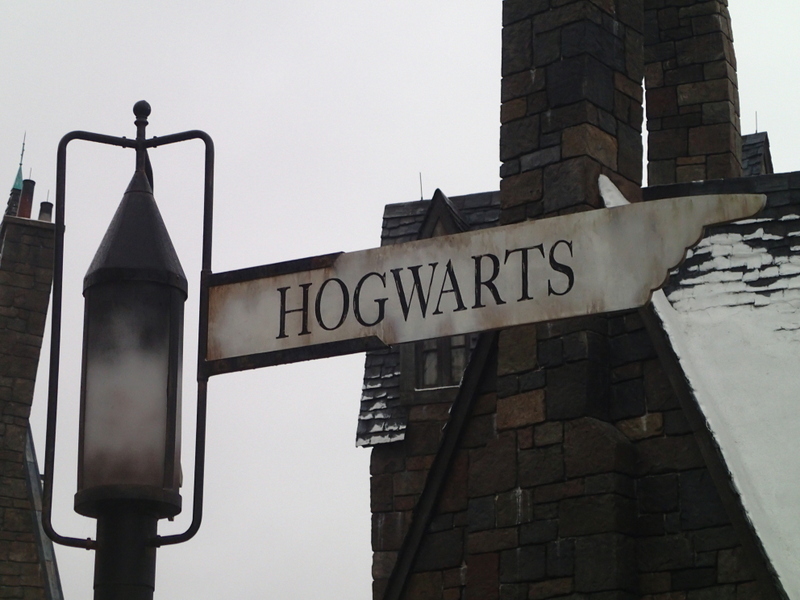 Then came the awkward moment when I had to explain that no, my cousin was my age, and that we were going to Harry Potter World… well, just because we wanted to. Whatever. Harry Potter is awesome, and Merrie and I have been wanting to check out the Universal versions of Hogsmeade and Hogwarts for years. 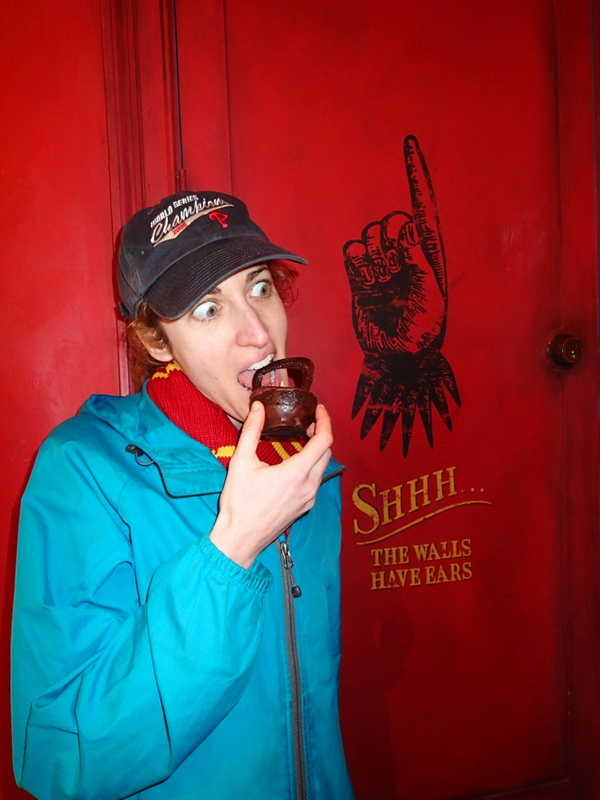 (And as a kidlit author myself with a particular penchant for writing about food, I was especially excited to do some taste-testing of Potter-inspired foods at The Three Broomsticks and Honeydukes!) So in the last week of January, off we went to Orlando. Hogwarts castle was truly impressive from the outside. But inside it was even better! 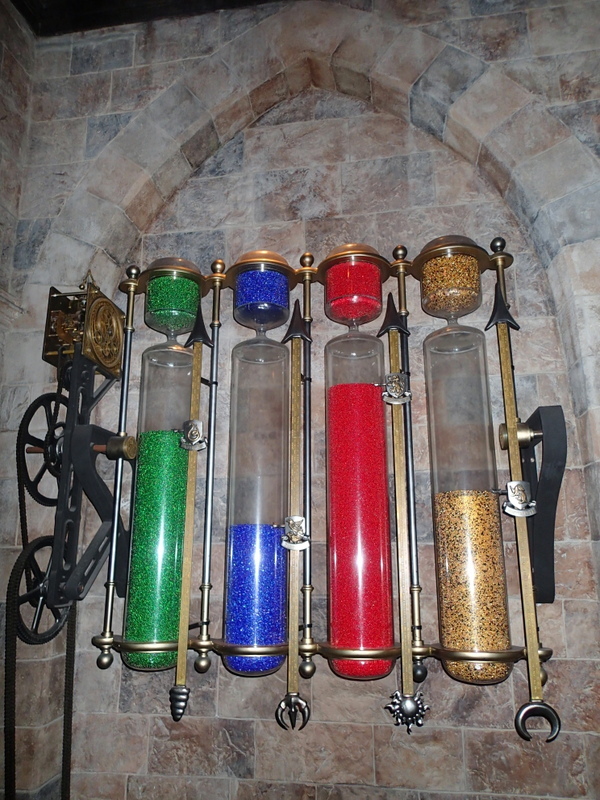 There’s so much to see as you wait in line for the Forbidden Journey ride–such as the house points hourglasses filled with emeralds for Slytherin, sapphires for Ravenclaw, rubies for Gryffindor, and…what the heck is Hufflepuff’s stone, anyway? 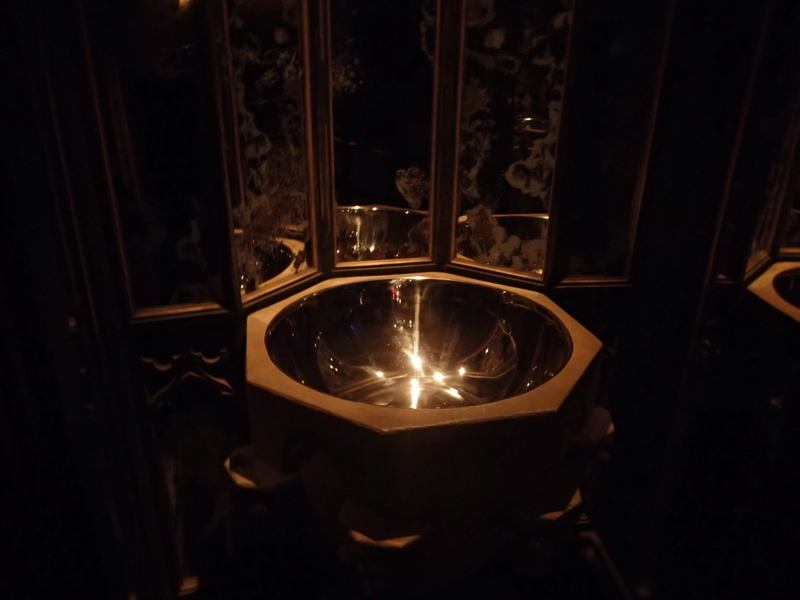 You could stop off for a quick look in the pensieve in Dumbledore’s office. 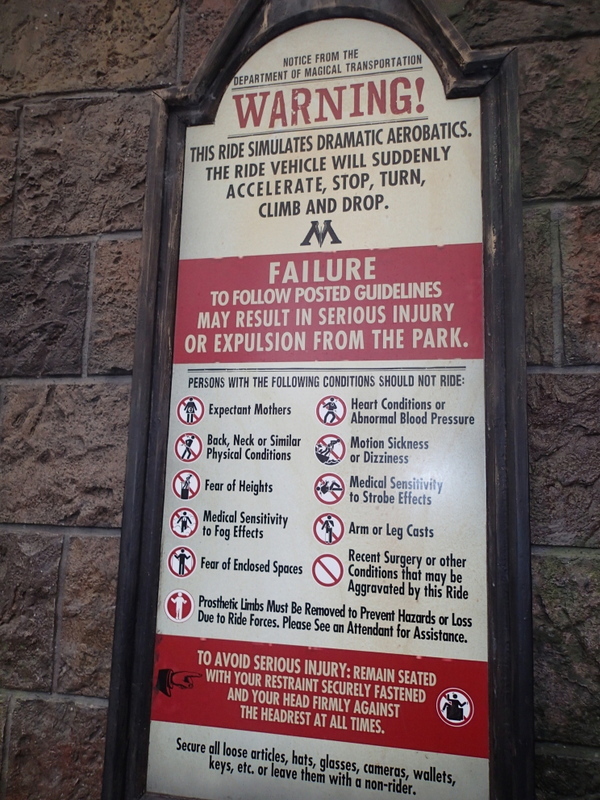 Merrie and I particularly enjoyed that the ride warning signs were provided by The Department of Magical Transportation. 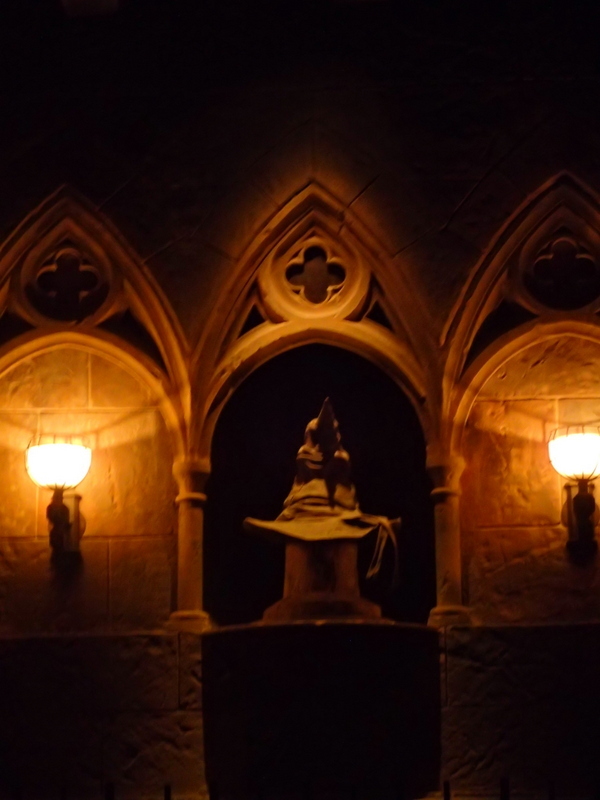 🙂 Closer to the ride entrance are walls of talking portraits… …and right before you enter, the sorting hat recites a rhyme about how pregnant ladies and people with heart conditions shouldn’t get on the ride. It was brilliant. In retrospect, perhaps I should have paid more attention to the sorting hat’s warnings about dizziness. The Forbidden Journey is a thrilling, but also kind of sickening ride. Once was enough for me and Merrie. 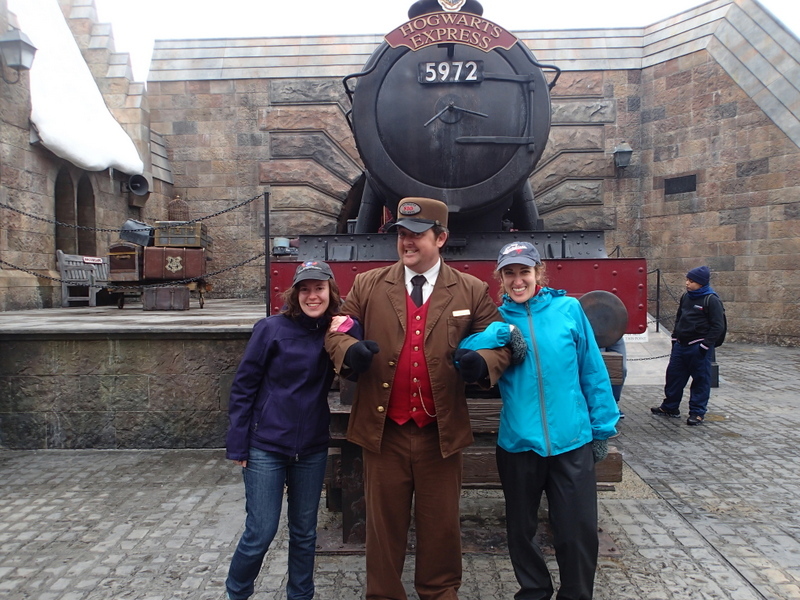 On to Hogsmeade! The rooftop snow is fake, but it could have been real that day–that’s how cold it was. Into The Three Broomsticks to warm up. 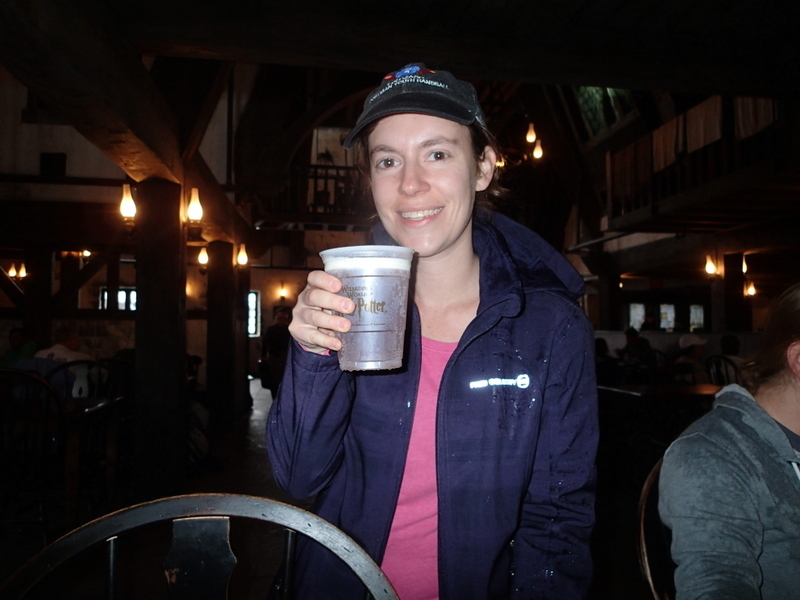 I was really hoping for a hot tankard of butterbeer, but alas, the only options were cold or frozen. I went with cold (drink on the right), and Merrie ordered a pumpkin juice and a strawberry-peanut-butter ice cream (which I believe is the flavor Harry eats at Florian Fortescue’s parlor in book 1). Cheers! Okay, honesty time–we were actually pretty disappointed with everything in this first order. The pumpkin juice was refreshing at first sip, but tasted more and more fake the more we drank of it, like artificial pumpkin-pie-flavored Kool-Aid. 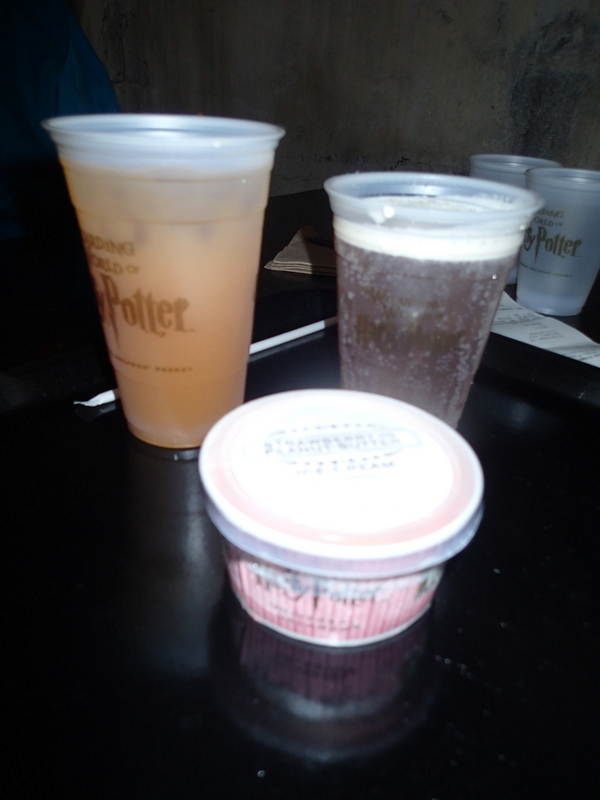 The butterbeer tasted kind of like cream soda with a thin butterscotch-flavored foam on top, and for me, once the foam was gone, so was the novelty. And the ice cream tasted mostly like peanut butter, which isn’t a bad thing, though it was frozen so solid that we really had to dig at it with our spoons. We finished the ice cream because…well, it’s ice cream, but couldn’t make it to the bottom of either of our drinks. Alas. 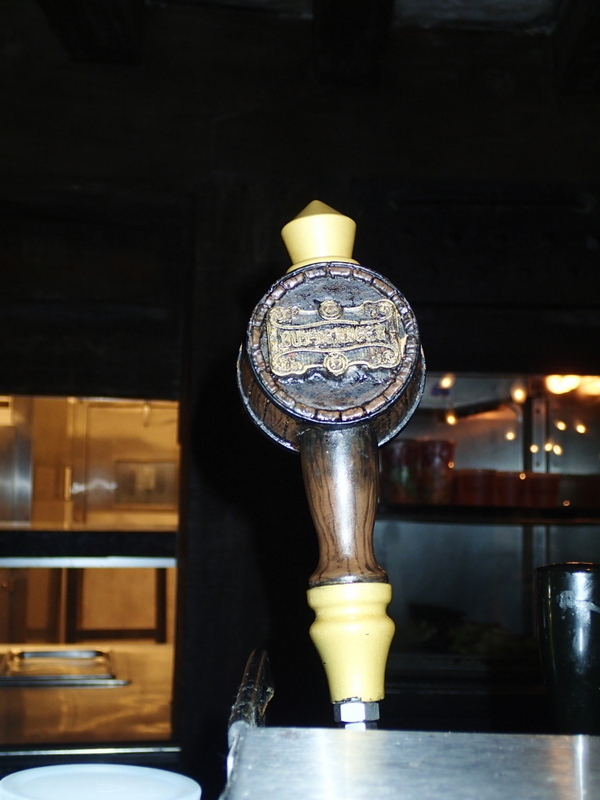 But the pub atmosphere was great, and it sure is fun to eat in a place where Butterbeer is on tap! 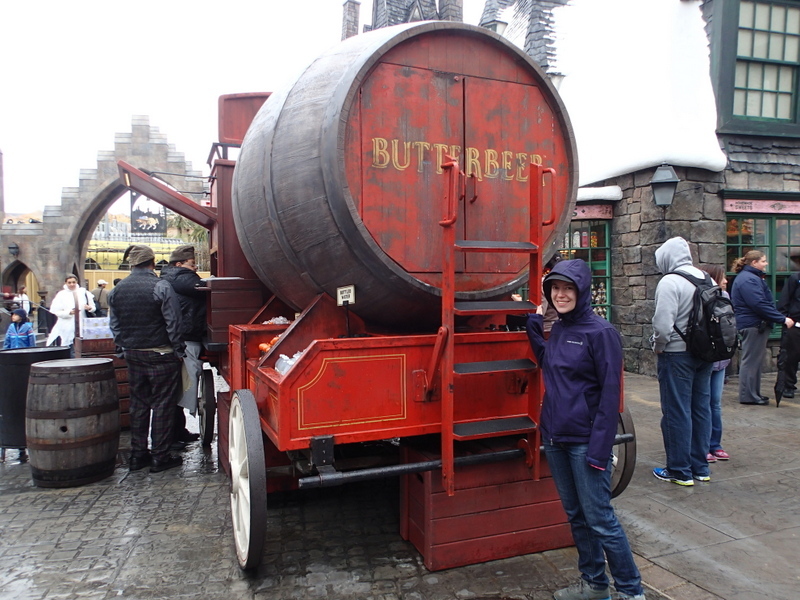 There was also a giant Butterbeer truck in the street. I bet that it’s really popular on non-freezing days. 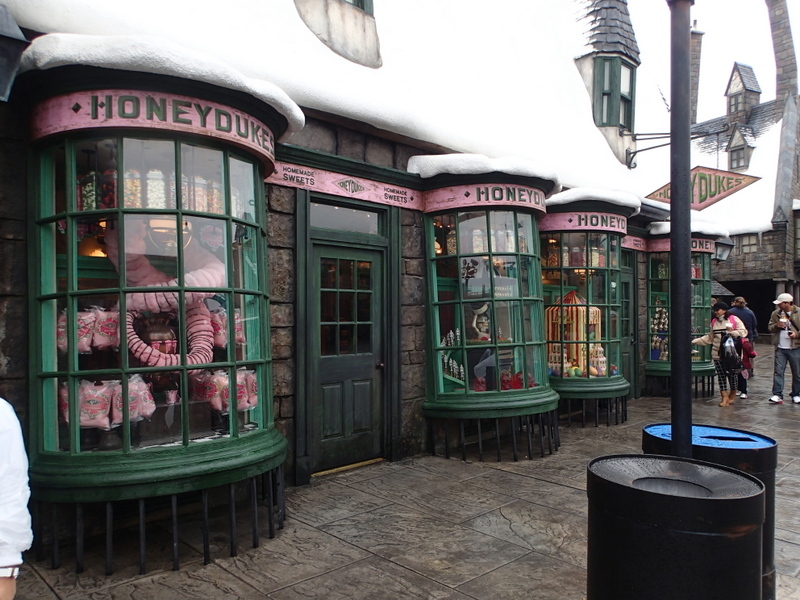 On to Honeydukes! 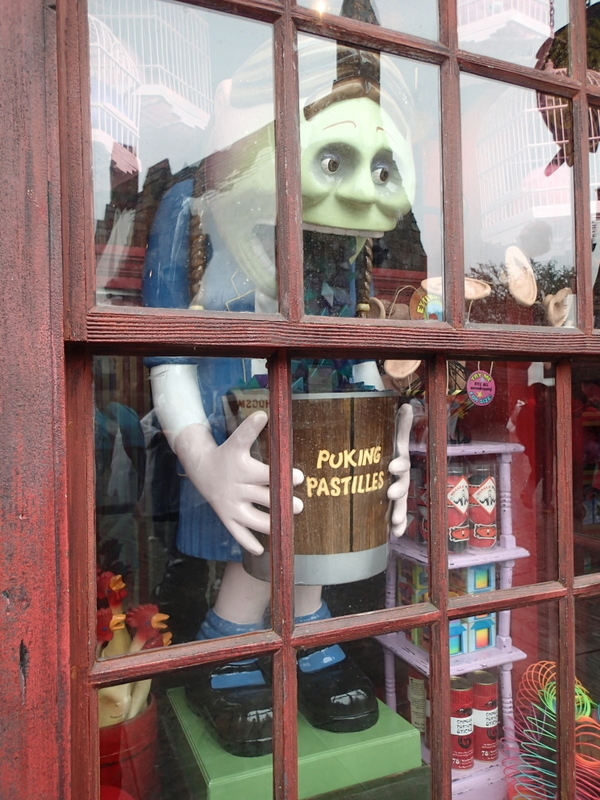 Possibly my favorite window dressing in all of Hogsmeade: an animatronic doll continuously puking a sheet of puking pastilles into a bucket. 🙂 While I thought that the prices at The Three Broomsticks were pretty reasonable for a theme park (specialty drinks around $3 and change, full meals $8-$15), the shops are definitely where they aim to get your galleons. 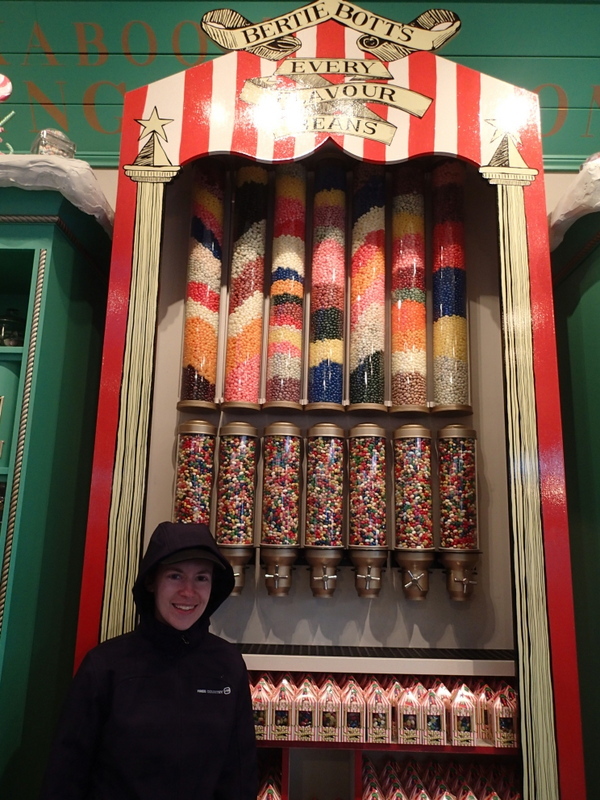 Almost every candy package at Honeydukes cost at least $10. 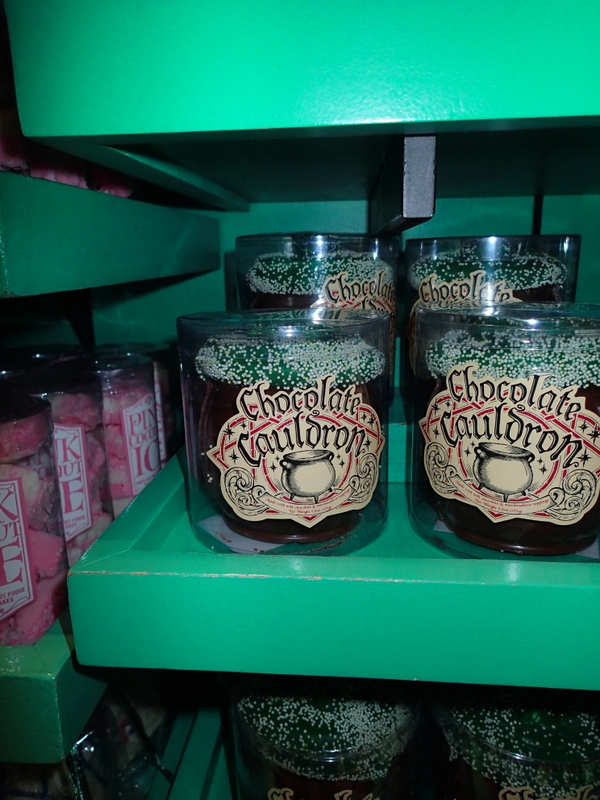 Still, it was fun to see so many items from the books–like Bertie Bott’s Every Flavor Beans. There were huge chocolate cauldrons filled with marshmallow… …and, in the bakery section, cauldron cakes, which apparently have about five different types of chocolate in them. 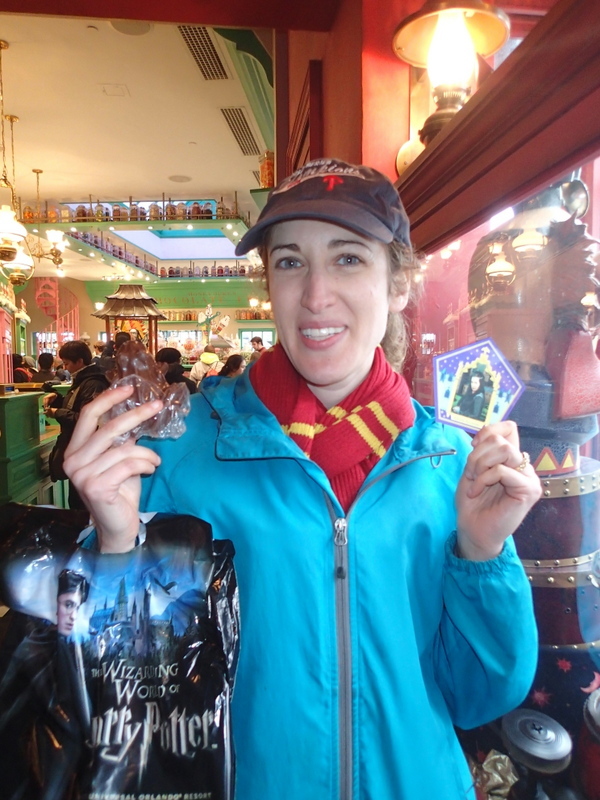 Merrie bought a chocolate frog, which comes with a cool pentagon-shaped wizard card inside. The frog is just a massive, solid block of milk chocolate, though, and it’s pretty hard to crack apart and share. (However, packages of much smaller peppermint toads were available, and Merrie hacked the system by refilling her chocolate frog box with toads so that her kids could open it up and enjoy them without getting frustrated by the giant frog. That’s an engineering mind at work right there!) 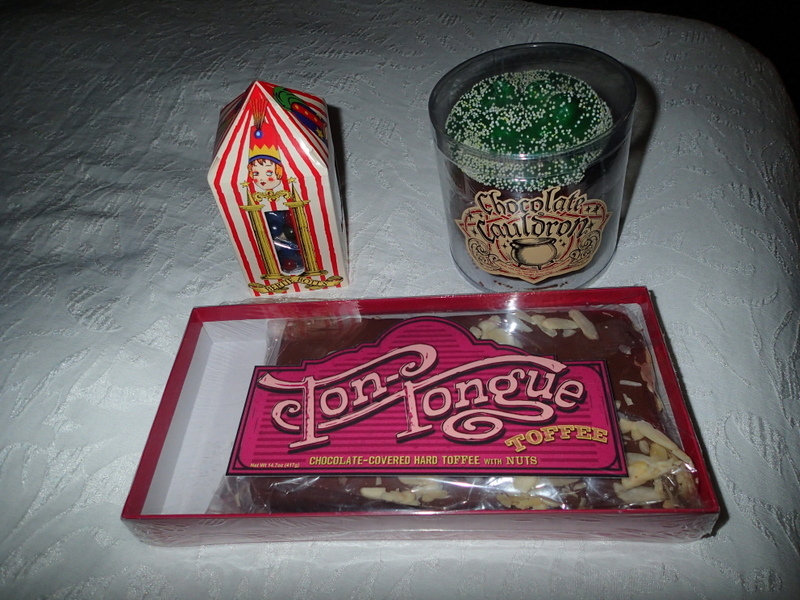 My haul from Honeydukes: Bertie Bott’s Beans and a chocolate cauldron for my students, and ton-tongue toffee for my husband. (Sadly, it did not turn his tongue into a three-yard-long purple snake–but it was sort of shaped like a giant tongue and did have a ton of calories!) 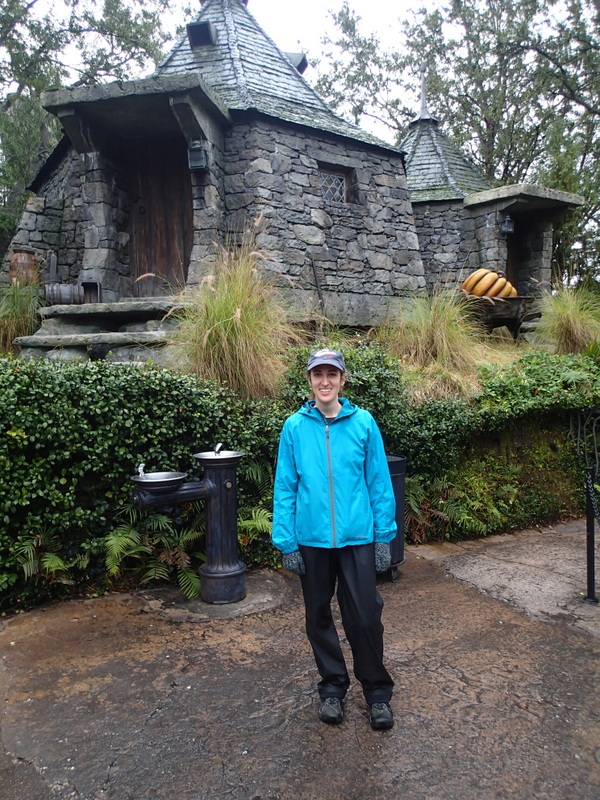 Here’s Merrie in front of Hagrid’s hut. Which, honestly, was a little nicer than I’d pictured it! Note the giant pumpkin in the yard. 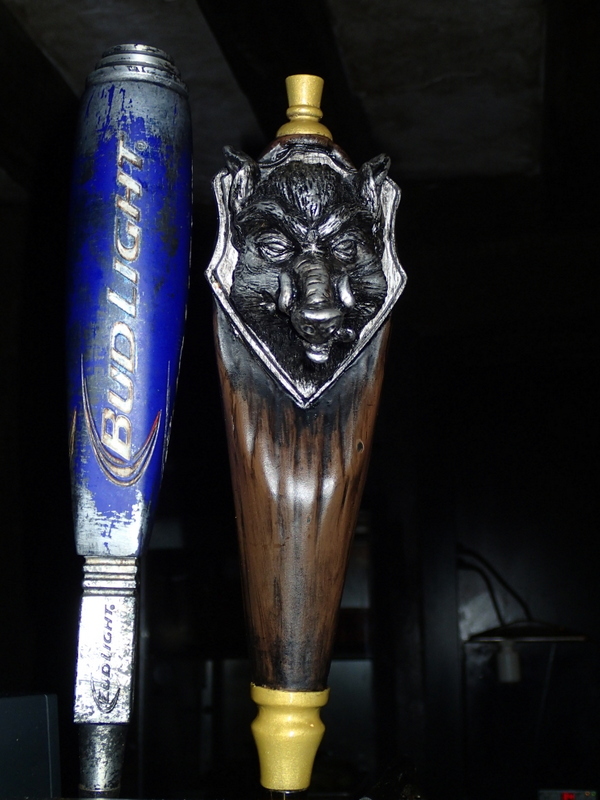 Hey, it’s lunchtime–back to The Three Broomsticks! 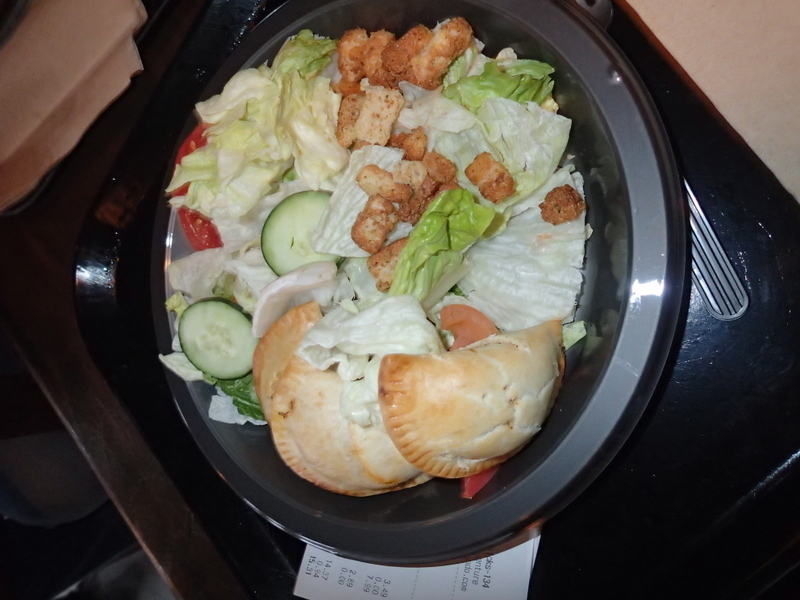 I opted for the Cornish Pastie lunch, which included three hot little meat pies and an enormous iceberg lettuce salad. The pies were good (mostly because they were hot). The salad was a salad. Merrie and I lamented that your meal does not magically float up through the table like it does at the Great Hall feasts in the books. That would be some good technology–er, I mean, magic. 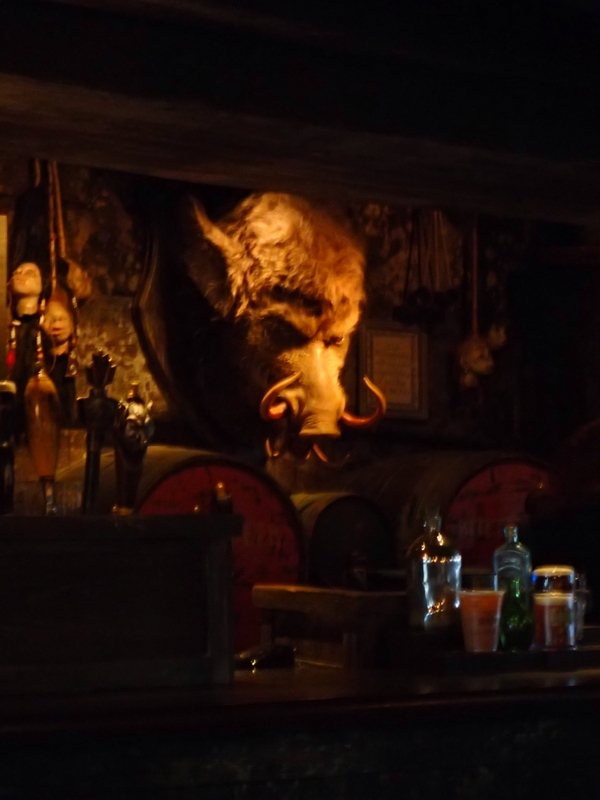 At Harry Potter World, The Hog’s Head is actually just an extension of The Three Broomsticks, but I did appreciate the enormous head behind the bar! And the head on the tap. I’m not sure what actually comes out of this tap, though. Anyone know? 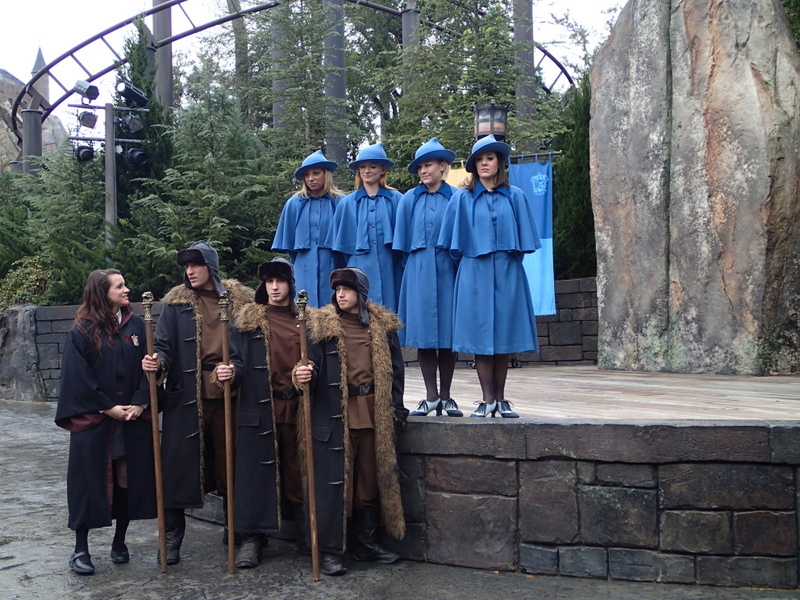 Oh, look–it’s students from Durmstrang and Beauxbatons! Apparently they sometimes do an acrobatic show, but the stage was too wet for them to perform. 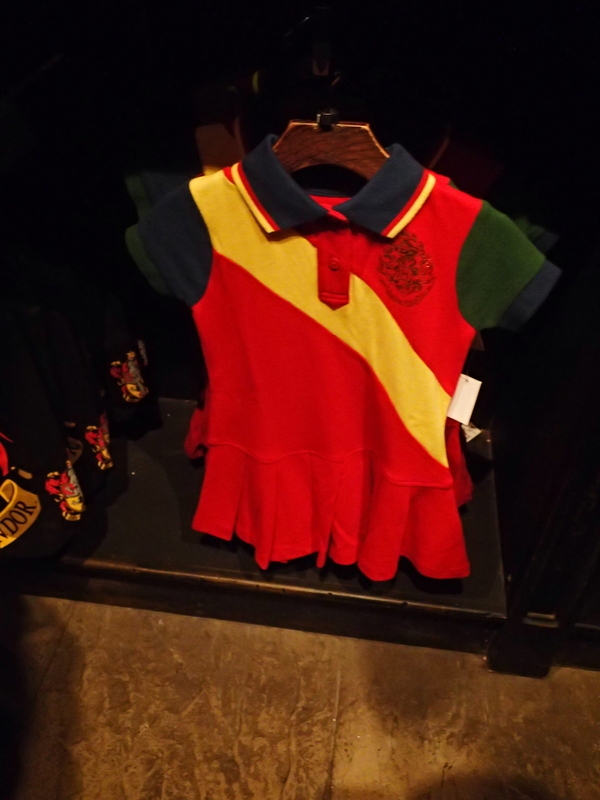 😦 While there were plenty of school scarves and hats and other expected apparel you could buy, what surprised me most was that you could also get Hogwarts cheerleading uniforms. Funny, I don’t remember cheerleaders in the books (though I can only imagine the height they could get on those basket tosses with the aid of a wingardium leviosa charm!). 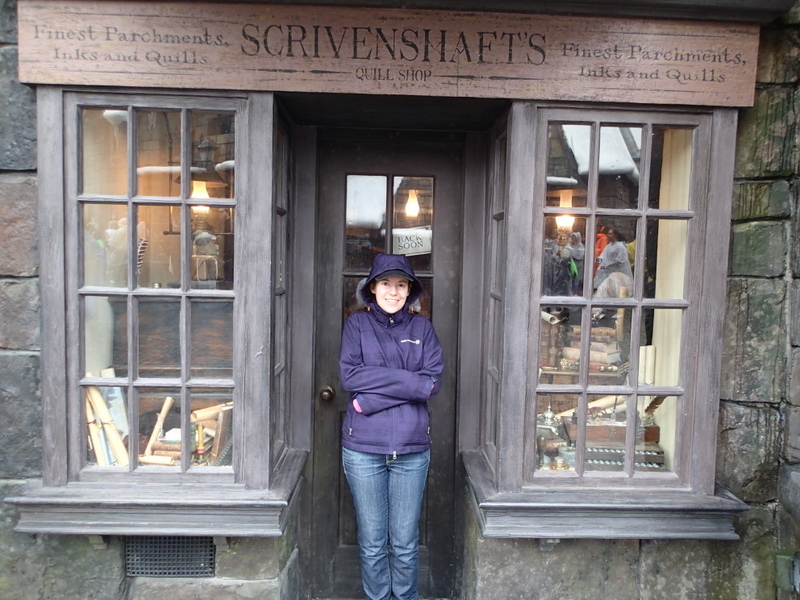 Merrie insisted that, as a writer, I take a picture in front of the quill shop. Thanks, cuz. 🙂 It was still freezing that afternoon, and we were hungry again, so we decided to give The Three Broomsticks one last try. 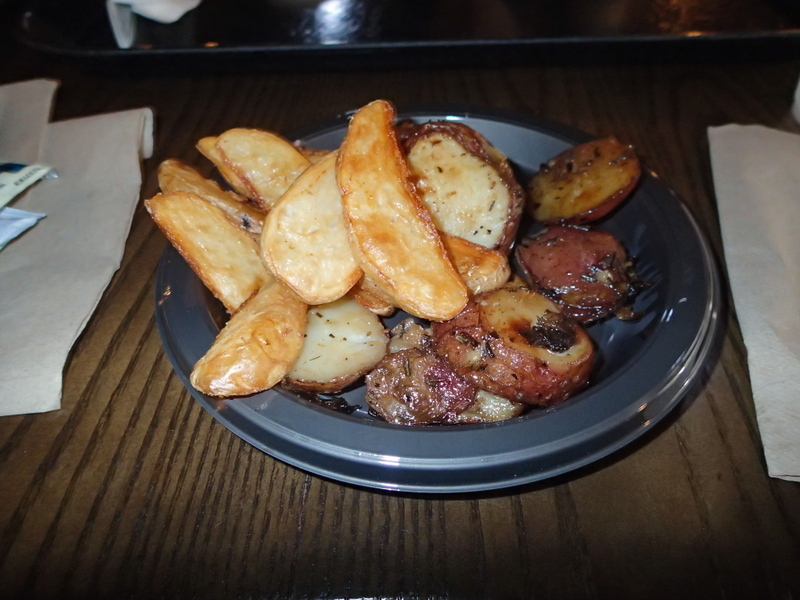 We ordered two potato side dishes: the seasoned fries and the garlicky potato wedges. Both were really tasty, and this visit got our biggest thumbs up of the day. 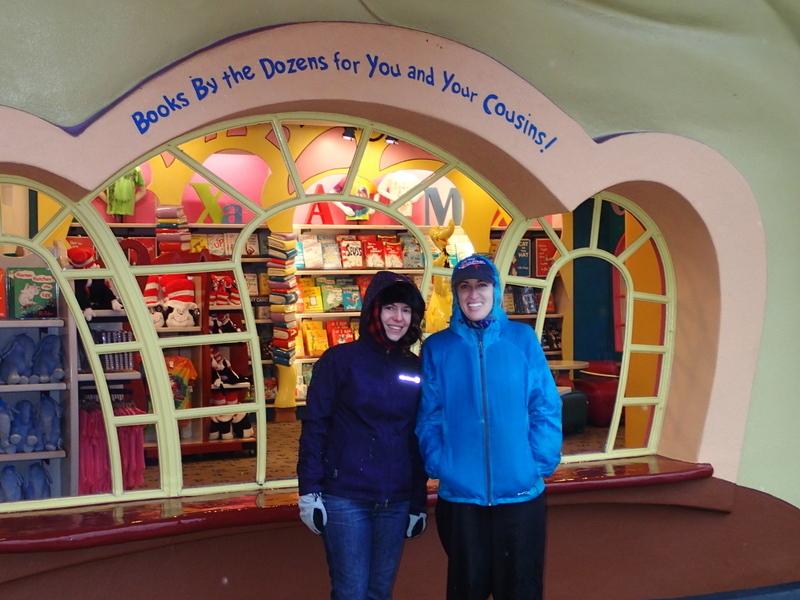 I’ll wrap things up now in a different section of Universal, outside the Dr. Seuss bookstore. A perfect place to take a picture with your cousin: note the quote! 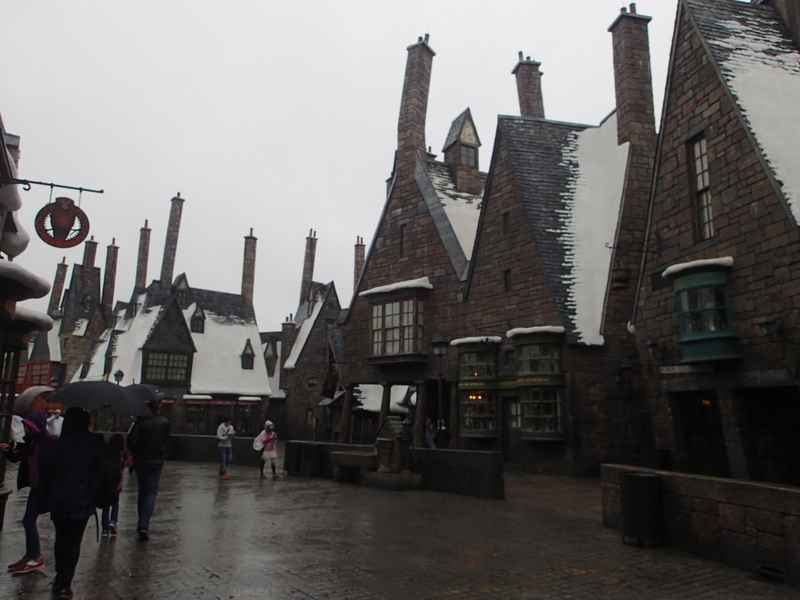 Despite the weather, and the nauseating ride, and the “meh” drinks, The Wizarding World of Harry Potter didn’t disappoint us. The level of detail put into the buildings and atmosphere was really impressive, and I’m sure that once the new section opens up this summer, it’s going to be even better. I’ll probably skip the pumpkin juice and Butterbeer next time, but I wouldn’t mind having some of those hot potato snacks right about now. Hooray for Harry Potter! Like this post? Then you’d probably love my middle-grade novels about tween restaurant critic Gladys Gatsby! 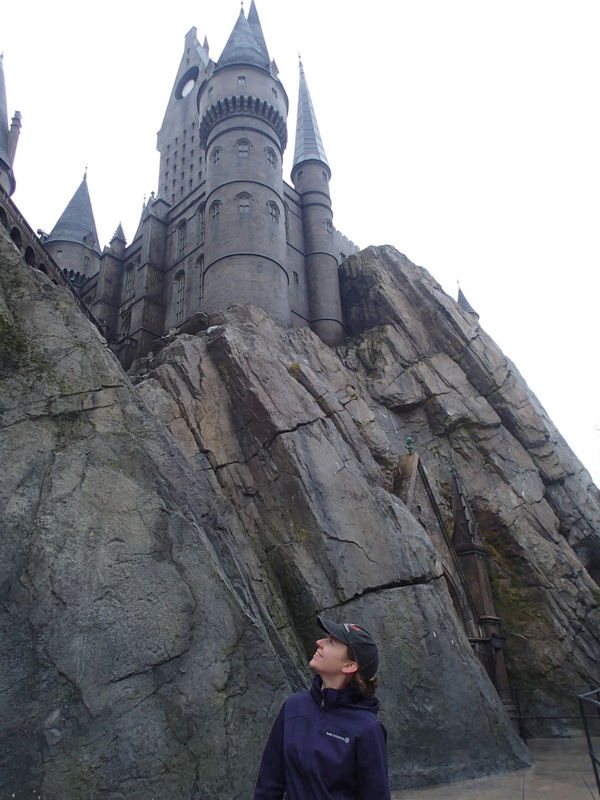 This entry was posted in food, Foodie Kidlit Friday, fun, Travel and tagged Florida, food, Foodie Kidlit Friday, Harry Potter, Orlando, Universal Studios by Tara Dairman. Bookmark the permalink.